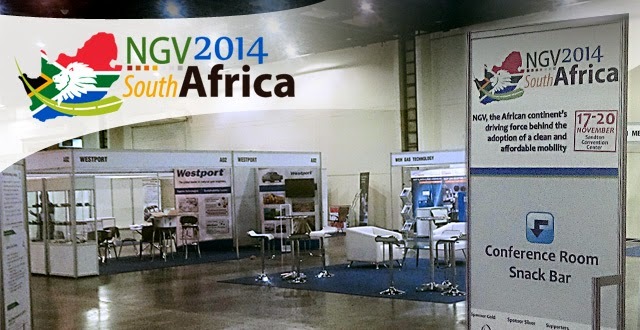 Johannesburg, South Africa is host to the first ever NGV event in South Africa and the Sub-Saharan African region during NGV2014 South Africa Conference and Exhibition this week. As the most developed and influential country in the African region, South Africa is an emerging natural gas vehicle (NGV) market that shows promising growth potential with the availability of natural gas in neighbouring countries and government initiatives to reduce greenhouse gas emissions. Today, in the state of Gauteng, there are about 385 taxis and buses already operating on compressed natural gas (CNG), with the Benoni Taxi Association committed converting 20 per cent of its fleet. At the show, attendees will have the chance to network with key NGV global players, listen to insightful conference speakers from Africa and around the world, and stroll the 4,000 square metre exhibition hall, where companies from across the globe will display their NGV technologies at the forefront of the industry. The Technical Tour, which wraps up the event on the last day, will take attendees on a tour to see a brand new refueling station and mother virtual pipeline in Johannesburg and will end in Benoni with a live vehicle conversion at Novo Energy’s facilities. Westport, engineering the most advanced natural gas engines and vehicles, is one of the companies that recognizes the potential of the South African market. On display at the Westport booth (A2), will be its original equipment manufacturer (OEM) and after-market conversion systems and components for on- and off- road applications ranging from forklifts to mining trucks and passenger vehicles to heavy duty trucks. Conference goers will also have the opportunity to hear Devis Canella, Westport Export Area Manager, share his views on the NGV market as a presenter on the Customers and Experiences of NGV and LNG Application panel on Wednesday, November 19.